There’s a common idiom that states that “the devil is in the details.” The Oxford dictionary defines the phrase as “the details of the matter are the most problematic aspect.” And when you translate that to building or modifying cars or trucks, it can mean that while finding a small block crate motor is a straightforward task, it’s all the little bits – the bolts and brackets and pulleys and dipsticks – can be hardest to locate and might actually hold up the completion of your project. That’s where Spectre Performance comes in. Spectre offers a complete line of the some of the hardest to find engine accessories, machined from aluminum or finished in triple chrome plating. And while some will improve performance, others just up the “wow” factor when a passer-by first looks under the hood of your project. You’ve spent countless hours selecting and installing the components of your ride. Let Spectre Performance make the final steps easy with their line of engine accessories for classic Chevrolet, Dodge, Ford, Oldsmobile, and Pontiac models. 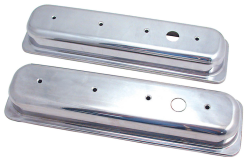 Spectre offers various chrome plated brackets, latches, and support bars for the most common classic V8 applications. We carry hood latches and radiator core supports for early Camaros, as well as chrome alternator brackets for small block Ford, and small and big block Chevrolet and Chrysler engines. There’s also a 10-piece alternator bracket set for a professional-looking mounting of the alternator on 1969-1986 small block Chevy engines with a long water pump. Spectre offers triple-plated chrome engine kits that include chrome valve covers with chrome valve cover wing bolts as well as other components that vary by application. In addition, some kits include a chrome air cleaner cover with lid or even Extraflow filter assemblies with lids. Kits are available for classic Big Block and Small Block Chevrolet, Chrysler, Ford 335 Series, 385 Series, FE Series, and Windsor engines. There are also kits for Oldsmobile V8 and Pontiac V8 engines. For Small Block Chevys, there are deluxe engine kits that include air filters, breathers, Y-wing valve cover bolts, and additional hardware. While aggressive-looking on the outside, many modern muscle cars are just a sea of plastic when you open the hood. If you own a 2011-2016 Mustang, Dodge Charger, Challenger, or 300, or a 2010-2015 Chevrolet Camaro, Spectre has the solution. These contemporary design covers for various underhood components, which differ by model, all cover the OEM parts so there’s never an issue with fit. And all have been extensively tested to make certain they can withstand the high temperatures under the hoods of modern muscle cars. Spectre offers chrome master cylinder covers for literally decades’ worth of General Motors, Ford Motor Company, and Chrysler Corporation models. The applications range from the traditional domed-lid bail-latched versions to the more modern snap-on type. A humble OEM dipstick can actually be an eyesore under the hood of an otherwise well-detailed engine bay. That’s why Spectre offers several designs, ranging from the OEM type loop, but with lustrous chrome plating, or dipsticks with billet aluminum handles. Chrome dipsticks are available for Small Block and Big Block Chevrolet, Small and Big Block Mopars, 335 and Windsor Fords, and Oldsmobile and Pontiac V8s. Billet handle dipsticks are available for small block Chevrolet, small block and big block Mopar, and Olds and Pontiac V8s. Spectre Peromance offers a wide array of oil pans in a variety of finishes and materials for classic American V8 engines. 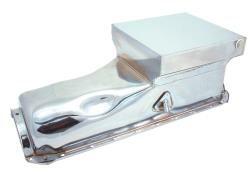 These oil pans range from unplated steel pans for Small Block and Big Block Chevys and Small Block Fords, to polished aluminum pans for Small Block Chevys and Fords, to triple chrome plated pans for a variety of GM, Ford, and Chrysler V8s. Spectre Performance also offers special extra capacity oil pans for competition applications, with available extended pickups for Small Block and Big Block Chevrolet V8 engines. So whether it’s a utilitarian plain steel look you’re going for, a more polished appearance, or the versatility and protection that a higher capacity oil pan affords, Spectre Performance has the oil pan that you need. The Saginaw power steering pump was not only installed on generations of General Motors vehicles, but was also installed in certain AMC, Ford, and Chrysler models from the 1960s through the 1970s. The Saginaw power steering pump is also a popular choice when adding power steering to older vehicles that weren’t equipped with the feature from the factory. As the pump is typically mounted front and center, a little flash helps. Spectre offers three type of dipsticks for the Saginaw pump: a triple-chrome replacement type, another with a dual-ring outer edge design, and a chrome-plated ABS cap that snaps over the OEM cap. Spectre offers alternator, water pump, and power steering pulleys for Chevy Small Block and Big Block engines, Ford engines, and 1979-2004 Mustang engines. Materials include triple chrome plated steel and machined aluminum in single, double, and triple belt configurations. Also available are individual component parts like alternator fans, pulley covers, and pulley shim kits. 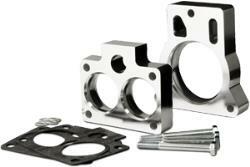 Inserted downstream of the throttle butterfly, a throttle body spacer increases the volume of the intake manifold so the engine can operate more efficiently, improving power, torque and fuel economy. Manufactured from high quality machine finished aluminum, Spectre's Chevy and GM throttle body spacers are designed to help improve the intake air flow of select Chevy and GM LSX, 4.3L, 5.0L, 5.7L, 6.2L and 7.4L engines. Spectre offers triple chrome plated steel or polished aluminum timing chain covers for your Chevy Big Block, Small Block, and Chrysler Big Block Engines. Along with adjustable timing tabs, for improved accuracy, these covers are fabricated from steel and triple chrome plated. Applications include Small Block Chevrolet and Big Block Chevrolet and Chrysler. 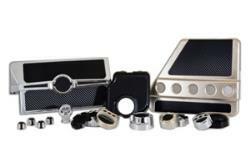 Spectre offers valve covers for a wide variety of engines, ranging from the Dodge Slant 6 to Ford’s high-performance BOSS 429 V8. Not only does the company offer a full range of six- and eight-cylinder valve covers manufactured from triple chrome plated steel, polished aluminum, gold iridite as well as a few extra styles, but the company offers a number of accessories as well. Several styles of valve cover bolts, cover spreader bars, O-Ring, and bolt styles are available, as well as oil filler caps and breathers. Spectre Performance engine accessories are engineered for optimum fit and function and the perfect complement to your time and effort. So whether you’ve started your project or are just planning on one, look to Spectre Performance to add some beauty to that beast of your engine.